These are the only sounds I hear as I focus on the waves while floating against the edge of a large infinity pool overlooking the beach. The sun is shining, keeping my wet skin wonderfully warm. A nap right now would be perfect. A little bird’s tweet snaps me out of my reverie several minutes later. I’ve been in my own little bubble without a care in the world. Pure bliss. I swim over to my private cabana for a little snooze. Welcome to The Mulia, where stress starts to melt away the moment I’m driven through the long and winding entrance to the extensive east coast resort in the more refined part of Bali, in Nusa Dua. I’m so completely relaxed that when I head to the day spa for more than three hours of treatments and massages I sleep — deeply — through every single thing. Before you dismiss this place because you don’t “do Bali”, let me jump in and assure you that I have never, ever been a Bali person. I’m still not. But The Mulia is different. Here I feel cocooned and safe. It doesn’t have any of the tackiness or chaos that Bali’s tourist areas are renowned for. And security is discretely ever-present. Little wonder obscenely wealthy, famous and powerful people feel safe bringing their families (and staff) on vacation. Plus it is incredibly clean — even the sand and water at the private beach are well maintained on a daily basis. And there are no small monkeys jumping around the pool or misbehaving on the furniture. Geger beach is calm, with waves crashing on a reef further out. Set on 30ha, the resort is far removed from reality — and isn’t that the point of a luxurious getaway? I make no apology for the fact I’m enjoying just chilling by the pool or at the spa or doing a stretching class. Experience has taught me that sometimes life can become crazy-busy and stressful so it’s important to not only welcome the rare quiet moments, but also embrace them. It’s about balance. The Mulia, The Mulia Resort & The Mulia Villas accommodation is split into three parts (hence the long name), ranging from the main resort in the centre, to the more-expensive suites at The Mulia, and topped off by the exclusive villas. Guests staying in the suites and villas have private swimming areas that are impressively quiet, even on busy weekends. They also have access to a butler. I spend two nights in a suite before moving to a private villa for my last night. Both have beach views. I love being in the water, so an outdoor spa is the highlight of my suite’s balcony. The deep, wide tub in my bathroom is pretty swanky, too. But the villa beats all that with a big, round spa in the bathroom and an outdoor shower in the garden. Oh, and my very own swimming pool. I have zero desire to leave this paradise, except to visit the grounds of Pura Geger temple on the nearby clifftop overlooking the beach. A couple of dogs and a coy ginger kitten keep a close eye on me and I wonder if I’m up to date with my shots. Those who appreciate the gentleness of Bali’s traditional culture need not fear, because Mulia has a distinctly Indonesian feel that extends from its friendly and helpful staff to the tasteful and abundant artwork. But I guess you can never please everyone — a couple of guests are disappointed that there is no smell of incense like in other resorts. To which I respond with a whole-hearted “thank the lord” because I dislike incense and am more than happy to enjoy the fresh air. I do, however appreciate beautiful fragrances, and often a subtle floral scent wafts around the resort that is so captivating it stops me in my tracks just to inhale deeply. Symbolism plays a big part in the aesthetic of Mulia (which means noble) — the most obvious being those magnificent 5m-high statues by the swimming pools. Forty-five of them, standing tall like white stone sentries. And all are women. There are three types: those holding a golden lotus flower; those carrying water; and the ones harvesting rice — a sign of prosperity. The rice ladies are my favourite, and the last thing I see before I go to sleep each night because my suite on the fifth floor not only faces the beach, but also overlooks the coveted Oasis infinity pool where 16 of these women stand guard. My view is an Instagram dream from the moment the first rose-hued hint of rays appear at sunrise about 5.30am to late at night when a brewing thunderstorm unleashes lightning in the distance. Even the stylish amenities boxes in the bathrooms represent guests’ experience. Each lid is topped with a ceramic animal: the rooster in the suites enjoys the sunrise; while the turtle in the villas is slow but steady and in no rush. The elephant in the resort rooms’ bathroom looks pretty playful and grand. The 526 resort rooms are beautifully decorated and reasonably priced, with rates starting from $US380 (about $525) plus taxes. The Grandeur is nearly 60sqm, while the Royal Suite is more than 80sqm. But it’s difficult to resist the beach view that can be enjoyed from every part of my suite, including the shower. There are three types of suites (a total of 111) — all with a butler service, balcony and outdoor spa. Baron is 105sqm; Earl is 130sqm; and the biggest, Marquess is nearly 300sqm. Prices start from $US750. I stay in the Earl suite, which reminds me of an Italian apartment with marble and glossy-wood furniture, and has four sections: a long balcony; a dining/living area with a powder room; a bedroom with a walk-in robe; and a big bathroom. It has two toilets. Now I wouldn’t normally mention toilets except these are pretty impressive. They have a motion detector to automatically lift the lid and warm the seat. They also have a bidet function, flush themselves and close the lid. Guests in the suites and villas have access to a butler. Mine are called Yogi and Hery. The suite is pretty sweet, but my eyes are practically popping out of my head when I move into my super-private villa — complete with garden areas, a day bed overlooking my swimming pool and an outdoor lounge/dining area that can be screened off. The villa itself has a lounge area and a dressing room connecting the bedroom to the bathroom. There are 108 villas, ranging in size from 505sqm for one-bedroom to 600sqm for a family and 1010sqm for two bedrooms. Prices start from $US980. I’m dropped off at my one-bedroom villa by buggy (standard transport for tackling the distance between the main resort and the secluded villas) and Hery opens the door into my garden. On a section of lawn, using small white pebbles of various sizes, he has written The West Australian in the same font of the newspaper’s masthead. I’m stunned by such a time-consuming and precise gesture of kindness. I cannot wipe the giant smile from my face and we joke about the fact he forgot to write my byline. I head out and return a few hours later to find another section of lawn with a different name: Mrs Grace. Wear non-slip shoes — the marble can get a little slippery when wet. The resort is fumigated, but I still use repellent because mosquitoes adore me, so it’s better to be safe than sorry. If the coffee machine and kettle are on the bottom shelf of the cupboard in your room, ask staff to put them up where you can easily access them. This didn’t occur to me until my butler suggested it, which is why I spent three days kneeling while waiting for my espresso. 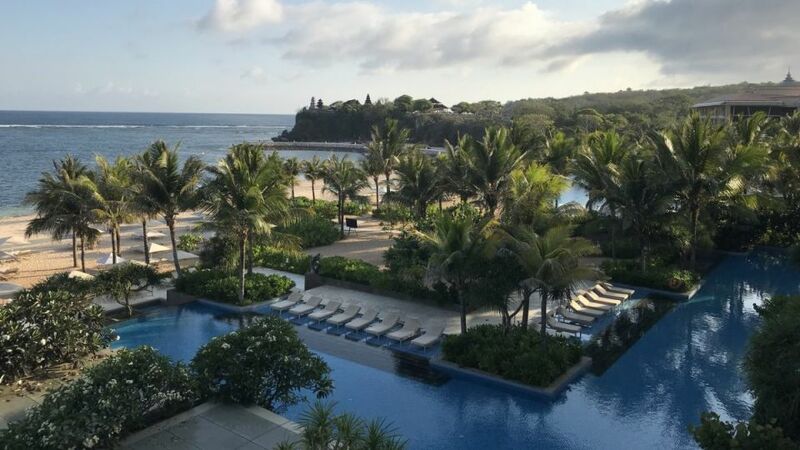 Grace Millimaci visited Bali as a guest of The Mulia, The Mulia Resort & The Mulia Villas. They have not seen or approved this story.